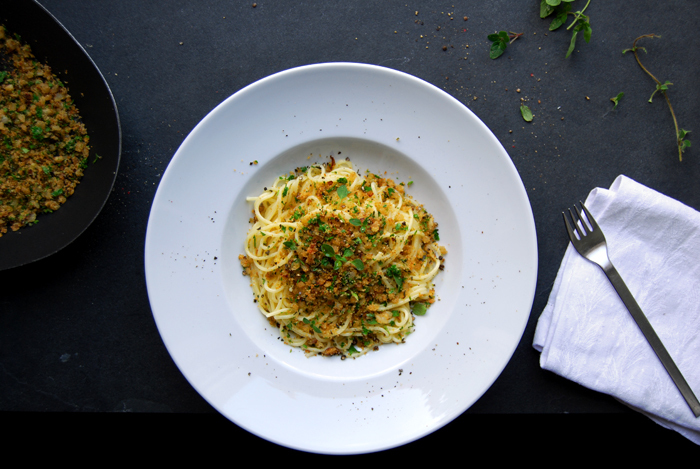 Here’s a great chance to bring a bit of summer back onto a big plate of pasta: just harvest whatever green leaves you find left on your kitchen herbs and tease your inspiration and mix them with golden sautéed onions, garlic and breadcrumbs – done! Basil, oregano, parsley, marjoram are perfect, I just wouldn’t go for woody herbs like thyme, rosemary or sage. You could also use dried herbs in case your herb garden has already closed its season. There are still some herbs left outside my windows, some look better than the others. One of them is an oregano plant which never seemed to be so happy with its situation. I moved it around, inside and outside, watered it a bit more and a bit less, changed the pot, but somehow it seems to be a bit moody. I didn’t want to stress it even more so I didn’t pick too many of its velvety leaves, so far. But now, it’s time has come! 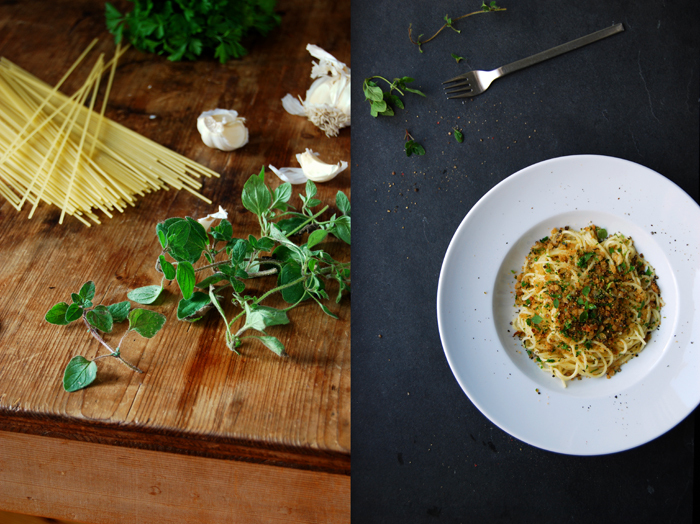 I wanted to have a fresh green mixture of oregano and parsley for my pasta topping, so this moody plant and I had to co-operate at last. It worked, the plant is still alive and the aromatic mixture was exactly what I had in mind! I’m a big fan of pangrattatos, especially in the colder season when the variety of fruits and vegetables is limited. This Italian dish is so convenient to use leftovers, stale bread, fresh or dried herbs, capers, sun-dried tomatoes, olives, chilies, you can throw in whatever sparks your inspiration. I made one with anchovies and lemon in June and I’m sure there will be more in the months to come! Cook the spaghetti in lots of salted water al dente. 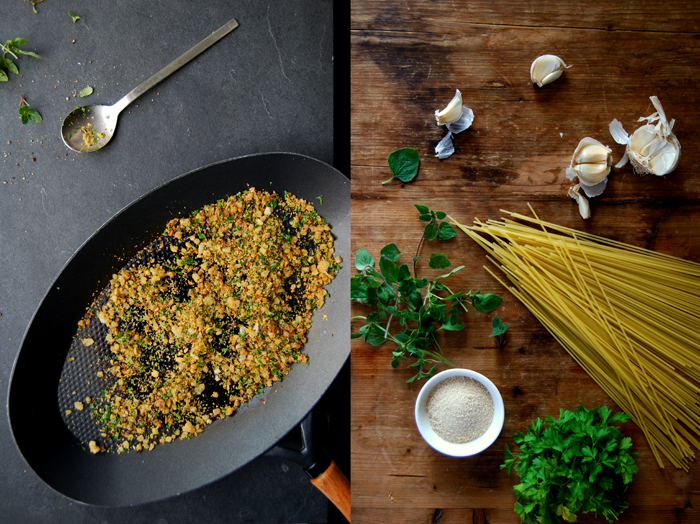 Keep a little of the water used to cook the pasta to mix with the cooked spaghetti, season with salt to taste. In a large pan, heat a splash of olive oil and cook the onions on medium heat for about 3 minutes until golden and soft. Add the garlic and cook for 1 minute. 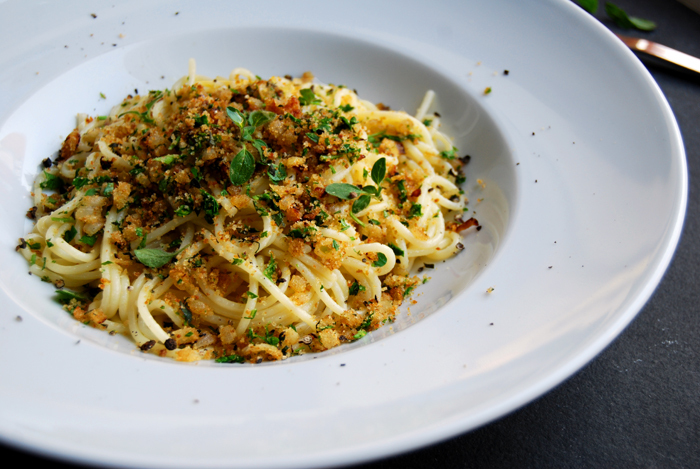 Push the onions and garlic aside, add a little more olive oil in the centre of the pan and add the breadcrumbs. Fry them for a few minutes until golden brown, stirring constantly. Mix with the onions and take the pan off the heat. 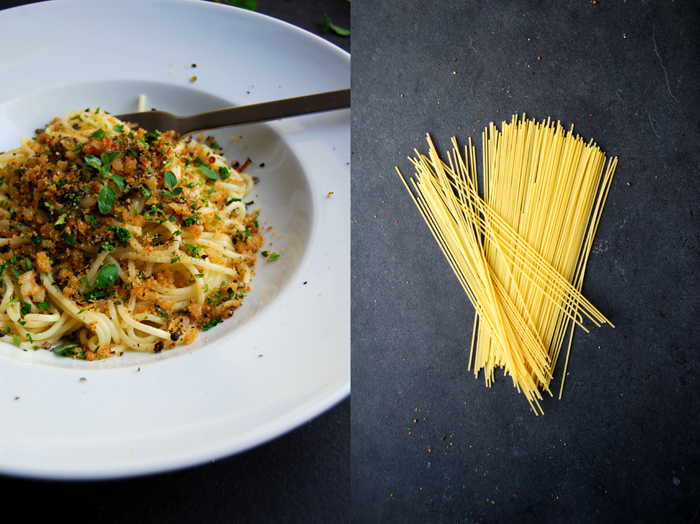 Stir in the chopped herbs and serve on top of the warm spaghetti with some crushed black pepper and oregano leaves. Yummy…pasta is one of my favorite foods!